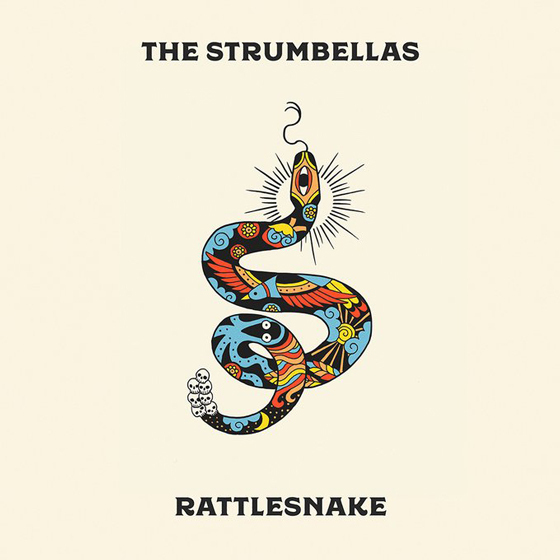 The press release for Rattlesnake calls it, "an uplifting album with songs that focus more on optimism." Musically, it has a bounce, with sing-along choruses and jangly, sunny guitars, yet the lyrics include discussions of sleeping all day because dreams are better, and an odd track about begging a partner to return. Making happy music about miserable things is a trick the Strumbellas do well: they can sing beautifully, and they have a tight connection as a band. A song like "Did I Die," on 2013's We Still Move On Dance Floors, about death and madness, sounds like a Sunday revival, decorative but pretty. This time around, the juxtaposition of lyric and form are a bit played out. They don't really resolve the tension between content and delivery on this album. The less optimistic they are, the more melancholy they are, the more interesting the work is. However, they are a still a little too earnest to do the heavy work of ironic displacement. On "The Party," a song with a modest croon, and an acoustic guitar and brushed drums, Simon Ward sings about his heart being broken, and not wanting to leave a house — but then the song gets louder, the voice becomes more of an uplift, and the whole track collapses: too much weight and effort on too few new ideas. Maybe all of this is churlish, and I can imagine this album doing very well, maybe not with critics, but with audiences. The production and the mixing will sound great in the middle of the summer on a festival stage. They know how to work around a harmony and the instrumentation is all excellent — there is nothing to fault in how Ward sings, or Jeremy Drury plays drums, but there is nothing to recommend it either, indistinct and mildly pleasurable, pop at its most anodyne.